In Honor of Purim… Happy Purim! A montage of images of Jewish dancing, including a clip from the (Mad) Adventures of Rabbi Jacob, a French comedy film. Michelle Citrin presents the Shake Your Grogger song. Gelbart meets Big Band. Kenny Ellis sings his hit single from his Hanukkah Swings! And now for something different… Ye ole Tom Lehrer song… Hanukkah in Santa Monca. A great concert with Racheli Arielle Yucht , Amanda Miryem-Khaye Seigel and a great ensemble featuring: Taylor Bergren-Chrisman, Avi Fox-Rosen, Zalmen Mlotek, Avram Pengas, Dmitri Zisl Slepovitch, and Matt Temkin. Bruce Roter has written a new melody for the traditional text of “Maoz Tzur”. It is performed by the Westminster Conservatory Youth Chorale, conducted by Frank Abrahams. The Conservatory is located on the campus of Rider University in Lawrenceville, NJ. The Chorale has completed several projects including a Jewish music series which includes their Chanukah CD called “Celebrate Chanukah” which has contemporary music of Michael Isaacson, Joel Philips, Eric Contzius, Ronald Hemmel, Baruch Cohon and Allan E. Naplan. Great venue & full menu; fine wines & sight-lines. No minimum order. WHEN: Sunday, December 9th at 3 PM, promises to be one of the most exciting in recent memory as it features the Anat Cohen Quartet. WHAT: Israeli clarinet and saxophonist Anat Cohen and group last appeared in New York, to rave reviews, at the Village Vanguard! 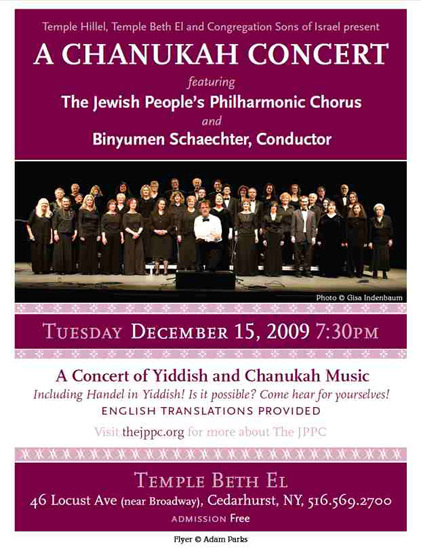 The Chanukah Concert is always a sell-out. Get your tickets now. Congregation Rodeph Sholom will celebrate Chanukah, the Festival of Lights, with a jubilant, inter-generational Shabbat service on Friday, December 14, 2012, at 6 P.M. This year’s extravaganza will include a medley of musical performances and songful prayers led by Rodeph Sholom’s Senior Cantor Rebecca Garfein, Associate Cantor Shayna De Lowe, and Cantorial-Intern Ben Ellerin. The first night of Chanukah this year is Saturday, December 8, 2012. ENTIRE STREET WILL BE CLOSED FOR THE EVENT! URJ has a special 2 CD set for Passover. You can learn the tunes… some songs for very young children are included, so there’s something for everyone, including modern and ‘traditional’ songs. Seder Songs features 22 fantastic tunes for the Passover seder. The collection includes some of the most tried-and-true traditional melodies from both Ashkenazi and Sephardi traditions, as well as the newest contemporary settings from artists like Peter and Ellen Allard, Noah Budin, Max Chaiken, Eric Komar, Steven Sher and Peri Smilow. The collection includes a variety of songs tailored to children as well as offerings for adults of all ages. A variety of singers and voices break up the album for more enjoyable listening and learning. Interesting Footage of early films from Purim pre-State in Israel. Not too late… for next year…. A new Yiddish song for Chanukkah. Take a listen klezmers. Some things get a sequel. This is version 3. Ask anyone under 35 in America to sing a Hannukah Song, and they’re likely to give you the full rendition of the Adam Sandler Hanukah Song… which you can see by this video is widely popular. Maccabeats– Do You Believe in Miracles? Monajat (Fervent Prayer) by innovative performer Galeet Dardashti, is inspired by Selihot, the poetic prayers of forgiveness recited during the month preceding the Jewish High Holidays according to the Middle Eastern tradition. Dardashti, a musician and anthropologist of Persian descent, re-imagines the Selihot ritual in collaboration with an acclaimed ensemble of musicians, an electronic soundscape, and dynamic video projections by video artist and designer Dmitry Kmelnitsky. Cost: FREE, and registration is not required. German soldiers out of uniform. musings and anecdotes on the Art of Beginning…Again.